LAHORE: Human Rights Commission of Pakistan (HRCP), South Asia Partnership (SAP), other non-governmental organisations and human rights activists have demanded the filtration of extremist elements from all political parties in order to avoid future incidents like the Gojra killings. 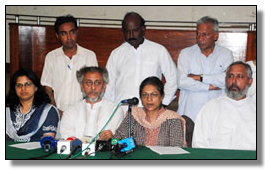 In a press conference held at the Lahore Press Club on Sunday, HRCP Chairperson Asma Jahangir said the blasphemy laws had become a tool for extremists and individuals who manipulated public sentiments to settle their scores or exploit situations. SAP Executive Director Mohammad Tehseen and human rights activists including Josef Francis and Irfan Barkat were also present. Repeal: Jahangir said it was necessary to repeal these laws to stop their exploitation since they affected all citizens, but mostly non-Muslims. The activists said representatives of the citizens, and non-governmental organisations were appalled by false or flimsy allegations of blasphemy against peaceful citizens. They said the Gojra incident was the worst example, since organised groups were allowed by the local administration to kill Christians. The extremists were still threatening Christians in Gojra and the tension was building up again. Monitoring: The activists emphasised the need to develop a monitor and an early warning system in areas where minorities were vulnerable to future attacks. They said a number of extremist elements were present in all political parties and those who had perpetrated the Gojra incident reportedly had links with some local leaders of a ruling party. The press conference stated that false accusations of blasphemy must be punished in equal measure and all such cases should be heard by the High Court and senior police officers should be deployed for investigation to ensure transparency. The activists urged the government to take stern action against clerics who spread hatred among citizens and misuse loud speakers.